We have created a new Facebook page for Mountain Colors. This a real learning experience. I figured out how to add the sharing button to our blog page. Any other suggestions about what I should add to the Facebook page would be most welcome! Please upload your projects that were made with Mountain Colors Yarn! 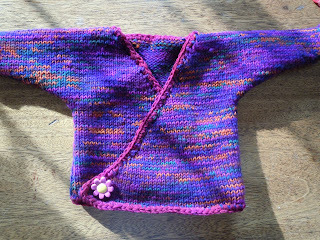 The photo I am including here is of a baby sweater made with two strands of Crazyfoot yarn. It was very quick and easy at 5 sts/inch. The pattern is from Mason-Dixon Knitting...it's the One Piece Baby Kimono. It took less than one skein of yarn for the body of the sweater and made a nice washable gift for the mother-to-be. We look forward to seeing YOUR projects made with our yarn. Please share! !